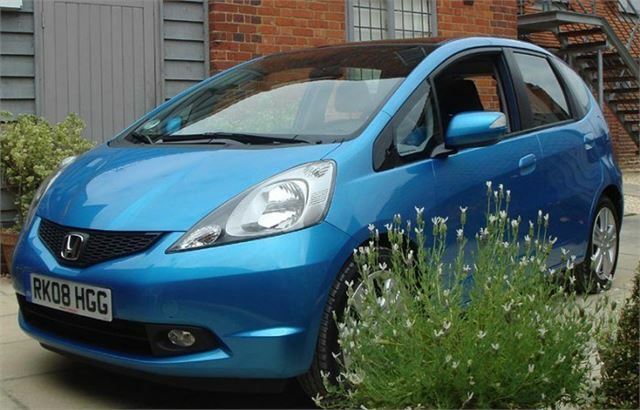 The new Honda Jazz goes on sale in the UK in October 2008. It’s slightly bigger, much prettier, and different from new Jazz sold in Japan since last October and in Thailand since March. The difference from the Japanese and Thai versions is why we had to wait for it so long. Instead of the new 100PS 1.3 and 120PS and 140PS 1.5 i-VTECs with a CVT-7 option on the 1.5, we are getting a 90PS 1.2 and a 100PS 1.4 I-VETEC with an optional 6-speed i-SHIFT automated manual. The reason is fuel economy and CO2 emissions. And a completely different UK and European market for the car from Japan and Thailand. In the EC tests, the new 1.2 manual will deliver an excellent 55.4mpg and emits just 120g/km CO2, putting it in Band B for VED at £35 this year, £30 next year. The only way to get this sort of figure for the automatic was to adopt the more efficient i-SHIFT automated clutch system developed for the Civic. Consequently, the 1.4 i-SHIFT manages 54.3mpg combined and, also at 120g/km, sneaks into the £35/£30 tax bracket. Only the 1.4 manual is over, at 124g/km with a combined fuel economy of 53.3mpg, and a Shift Indicator Light to tell you the optimum engine speed to change gear. 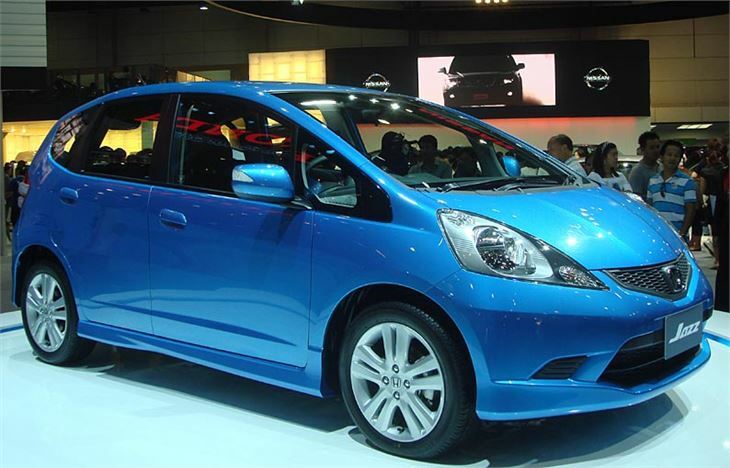 Outside, as you can see, the new Jazz is a really pretty car, instantly making the old model look dated and box-like. 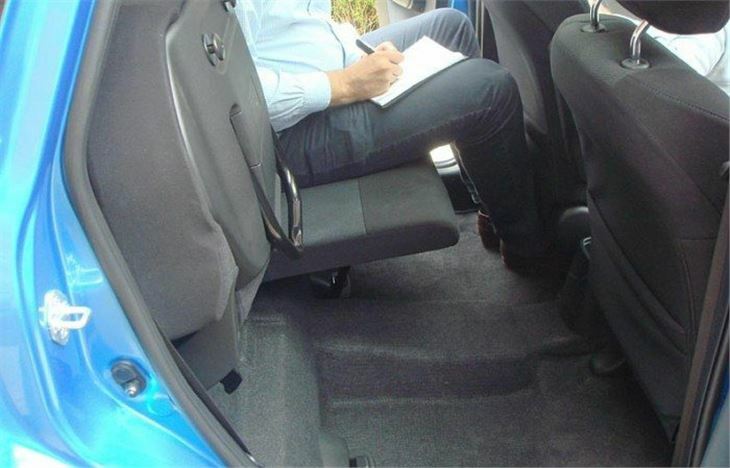 Inside, it has the same ‘magic’ seat system, but it works better, folding down in one go without having to move the front seats, and retaining the upward folding squabs that release enough space in the centre of the car for a wheelchair. The dash is completely different from the Thai/Japanese versions, not being designed around a factory fit satnav screen or double DIN socket. It’s a nice dash, though, with clear, easy to understand controls and twin gloveboxes on the passenger side. 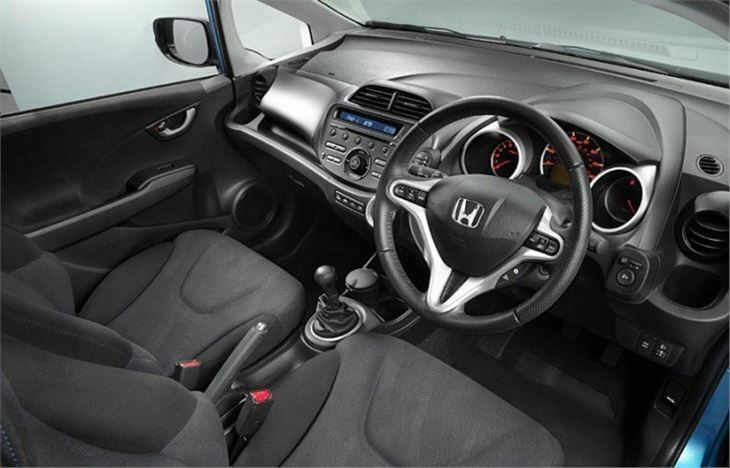 And the dished steering wheel is really good, just like the Civic’s. Cupholders abound. Throughout the cabin there are no less than ten. There are storage places all over, including in the base of the left side rear seat. 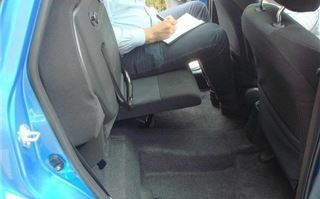 Visibility is better from all the seats, though the fixed panoramic glass sun-top on SE versions robs the rear seat passengers of a few centimetres of headroom. 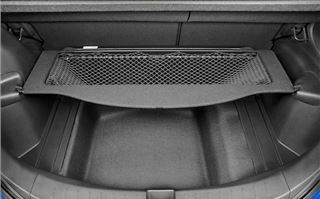 The ‘Double Trunk’ boot floor does all sorts of interesting things, incorporating a net for bottles and a bi-folding floor that can be configured in four different ways to separate different types of shopping. 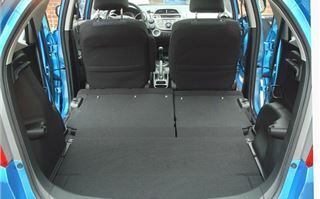 Total luggage space, seats up, is 399 litres, which is bigger than some MPVs. There is no spare wheel, just a tyre-fix kit for minor punctures, though some kind of spare may be made optional. Instead of slow revving twin plug i-DSIs, the all-new chain cam engines employ i-VTEC variable valve timing to offer flexibility as well as performance and economy. Dual front and side airbags and full-length side curtain airbags are standard on all models, and the passenger airbag is switchable. 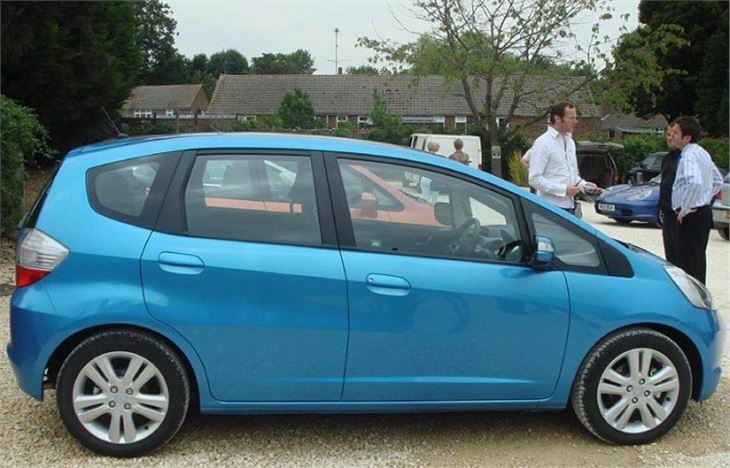 Entertainment is taken care of by a single CD/radio offering MP3/WMA playback and on EX models there is a USB adaptor in the centre console allowing iPods and memory sticks to be downloaded. In the 1.4 manual, the 100PS i-VTEC is certainly a lot livelier than the old 83PS i-DSI. It revs freely and cheerfully, while at the same time delivering decent low speed torque via overall gearing that gives 20mph per 1,000rpm in 5th. To get the best out of the new engines they need to be run on 97-99Ron Superunleaded rather than 95Ron Premium Unleaded. The steering castor angle has been moved forward and a 50% more powerful electric motor employed. These combine to make the steering much more positive and accurate than the old car and it holds its line through a fast bend very well. On 185/55 x 16 tyres (one inch up on the old car, but the same profile), and with longer rear suspension arms ride is definitely better, though still not as good as a Focus. I clearly remember the ride and handling being the one disappointment of the original Jazz, forgiven because of the car’s brilliant versatility. There is no such disappointment with the new car. It holds its head up against the opposition, and while not being as compliant as the new SEAT Ibiza (on standard suspension) or as sharp as the Mazda 2, it’s fine. 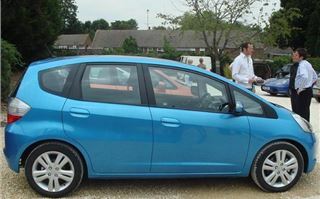 It is a bit expensive, though, starting at £10,000 and going up to £14,000. And Honda doesn’t like to discount, which is why used Jazz values held up so well. 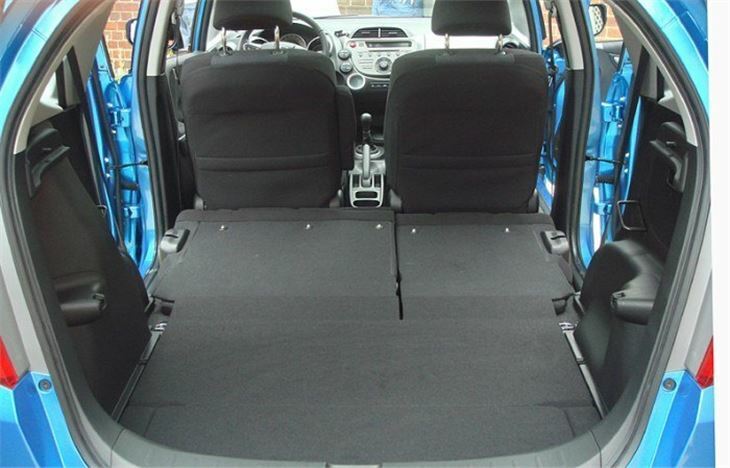 With the added benefit of £35/£30 annual tax, good residuals look set to continue, making the car a safe place for your money as well as the most adaptable and versatile small car you can buy. Click the tabs for prices, specifications, engines, transmissions, dimensions and performance.